1.Five Year S&P +52% vs. MSCI EFA (developed market)-5%. S&P Trading 25% Above Median P/E vs EFA 10% Below Median. S&P vs. EFA 5 Year Chart. 2. Natural Gas Up Over 50% One Year…Natural Gas Stocks Down. The ISE-Revere Natural GasTM Index is comprised of exchange-listed companies that derive a substantial portion of their revenues from the exploration and production of natural gas. The Index is constructed by establishing the universe of U.S. listed stocks of companies involved in the exploration and production of natural gas. Companies whose natural gas proved reserves do not meet certain requirements are eliminated. 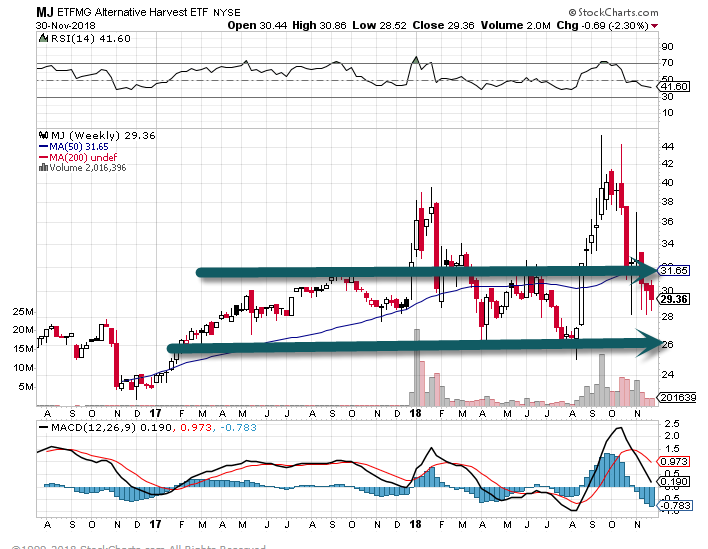 The third quarter earnings reporting period that spanned from early October through mid-November was a rough one for investors. 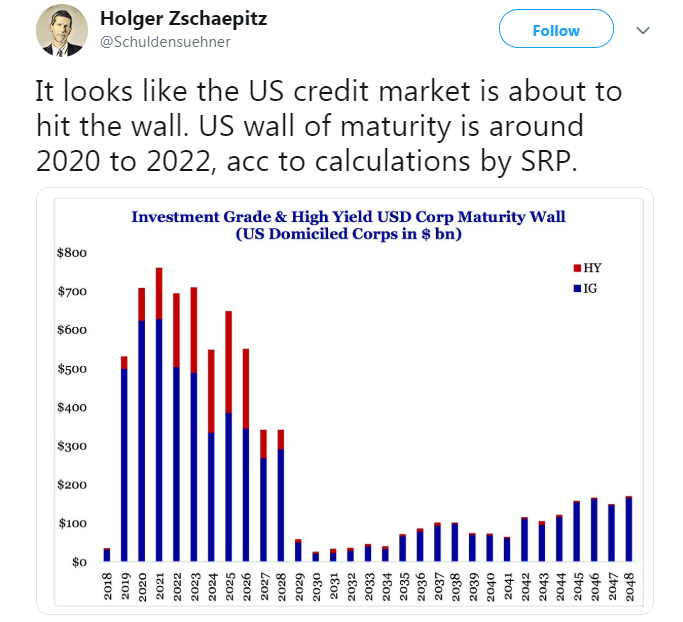 The broad market struggled quite a bit during this period, and the actual earnings reports coming from corporate America were weaker relative to recent quarters. Since the unofficial earnings season ended with Wal-Mart’s (WMT) report on November 15th, though, earnings have been coming in a little better. Just over 100 companies have reported since the 15th, and below are a few stats worth highlighting. 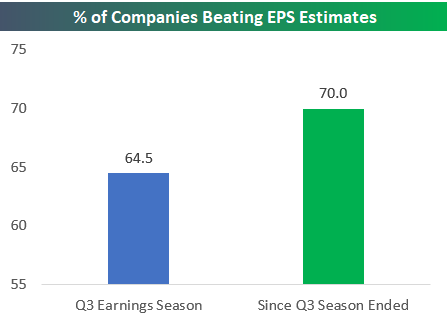 The first chart below shows the percentage of companies that beat consensus EPS estimates during the Q3 earnings season and since the season ended. As shown, the EPS beat rate since earnings season ended stands at 70%, which is 5.5 percentage points higher than the beat rate seen during the Q3 earnings season. Top-line beat rates have also improved a bit. 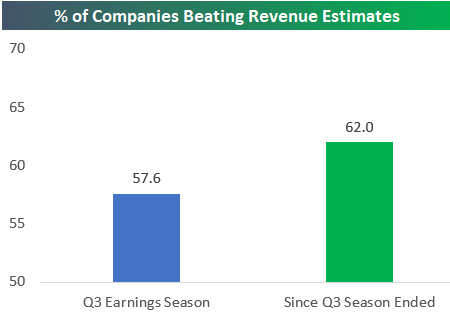 During earnings season, only 57.6% of companies beat revenue estimates, while the beat rate stands at 62% for companies that have reported since then. Finally, stock prices are reacting much more positively to earnings reports as well. During earnings season, the average stock that reported fell 0.14% on its earnings reaction day (the first trading day following the earnings release). Since earnings season ended, the 100+ companies that have reported have averaged a one-day gain of 1.68% in response to earnings. 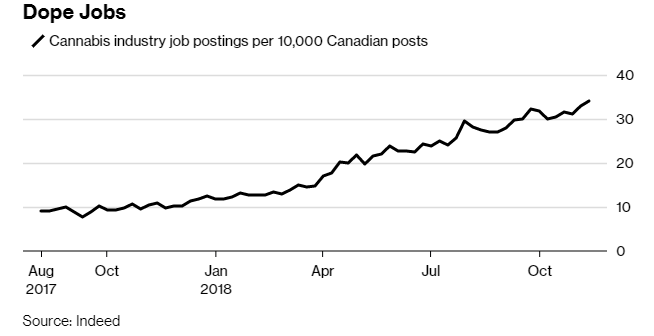 5.Canada is Short Weed Workers. 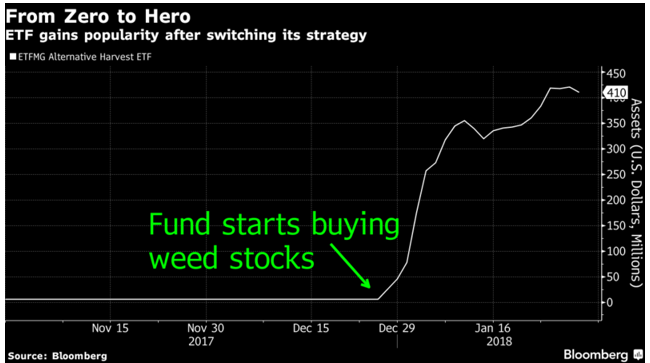 A class of synthetic drugs has replaced heroin in many major American drug markets, ushering in a more deadly phase of the opioid epidemic. New numbers Thursday from the Centers for Disease Control and Prevention show that drug overdoses killed more than 70,000 Americans in 2017, a record. 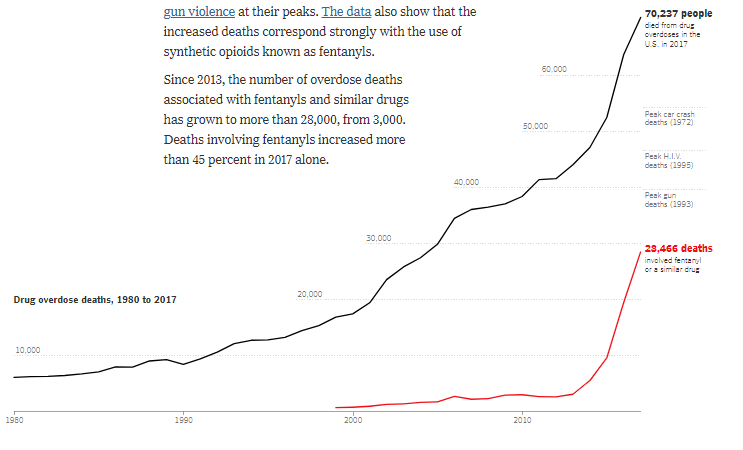 Overdose deaths are higher than deaths from H.I.V., car crashes or gun violence at their peaks. The data also show that the increased deaths correspond strongly with the use of synthetic opioids known as fentanyls. Since 2013, the number of overdose deaths associated with fentanyls and similar drugs has grown to more than 28,000, from 3,000. Deaths involving fentanyls increased more than 45 percent in 2017 alone. 8.Tech Disrupting Residential Real Estate? More than two-thirds of U.S. homes sell for $400,000 or less, according to U.S. Census data and the National Association of Realtors. 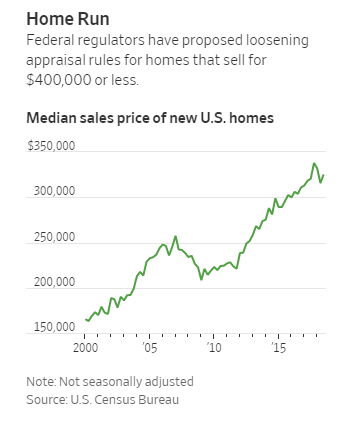 If the regulators’ proposal had been in force last year, about 214,000 additional home sales, or some $68 billion worth, could have been made without an appraisal, regulators said in their 69-page proposal. 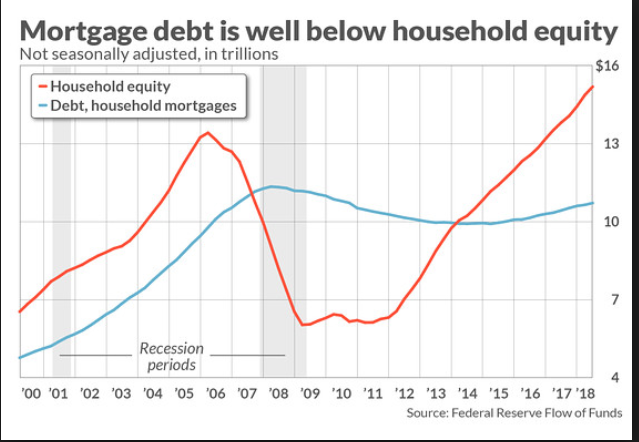 9.Mortgage Debt Well Below Household Equity. To motivate your team to achieve the highest levels of performance (and create an extraordinary organization in the process), here are the qualities you should model every day. Awareness There is a difference between management and employees, bosses and workers. Leaders understand the nature of this difference and accept it; it informs their image, their actions, and their communication. They conduct themselves in a way that sets them apart from their employees–not in a manner that suggests they are better than others, but in a way that permits them to retain an objective perspective on everything that’s going on in their organization. Decisiveness All leaders must make tough decisions. It goes with the job. They understand that in certain situations, difficult and timely decisions must be made in the best interests of the entire organization, decisions that require a firmness, authority, and finality that will not please everyone. Extraordinary leaders don’t hesitate in such situations. They also know when not to act unilaterally but instead foster collaborative decision making. Empathy Extraordinary leaders praise in public and address problems in private, with a genuine concern. The best leaders guide employees through challenges, always on the lookout for solutions to foster the long-term success of the organization. Rather than making things personal when they encounter problems, or assigning blame to individuals, leaders look for constructive solutions and focus on moving forward. Accountability Extraordinary leaders take responsibility for everyone’s performance, including their own. They follow up on all outstanding issues, check in on employees, and monitor the effectiveness of company policies and procedures. When things are going well, they praise. When problems arise, they identify them quickly, seek solutions, and get things back on track. Confidence Not only are the best leaders confident, but their confidence is contagious. Employees are naturally drawn to them, seek their advice, and feel more confident as a result. When challenged, they don’t give in too easily, because they know their ideas, opinions, and strategies are well-informed and the result of much hard work. But when proven wrong, they take responsibility and quickly act to improve the situations within their authority. Optimism The very best leaders are a source of positive energy.They communicate easily. They are intrinsically helpful and genuinely concerned for other people’s welfare. They always seem to have a solution, and always know what to say to inspire and reassure. They avoid personal criticism and pessimistic thinking, and look for ways to gain consensus and get people to work together efficiently and effectively as a team. Honesty Strong leaders treat people the way they want to be treated. They are extremely ethical and believe that honesty, effort, and reliability form the foundation of success. They embody these values so overtly that no employee doubts their integrity for a minute. They share information openly, and avoid spin control. Focus Extraordinary leaders plan ahead, and they are supremely organized. They think through multiple scenarios and the possible impacts of their decisions, while considering viable alternatives and making plans and strategies–all targeted toward success. Once prepared, they establish strategies, processes, and routines so that high performance is tangible, easily defined, and monitored. They communicate their plans to key players and have contingency plans in the event that last-minute changes require a new direction (which they often do). Inspiration Put it all together, and what emerges is a picture of the truly inspiring leader: someone who communicates clearly, concisely, and often, and by doing so motivates everyone to give his or her best all the time. They challenge their people by setting high but attainable standards and expectations, and then giving them the support, tools, training, and latitude to pursue those goals and become the best employees they can possibly be.